XPE Micro-analytical Balances High Accuracy for Very Small Samples - Are your samples very valuable? Are they only available in small quantities or effective in just the tiniest of doses? Or perhaps you want to weigh with a larger tare container? 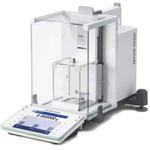 XPE micro-analytical balances display unsurpassed accuracy even with the smallest of samples. The XPE56 microbalance has a unique maximum capacity of 52 g with readability 0.1 µg, providing a resolution of 52,000,000 points. Highly sensitive, and yet robust, the XPE56 is perfect for weighing the smallest samples directly into larger tare containers. XPE micro-analytical balances deliver the highest capacity coupled with the lowest possible minimum weight. Dose directly into a larger tare container, saving valuable material and making significant cost reductions. The new embedded technology automatically detects static charges and warns the user when results are out of tolerance. For highest process security, anti-static measures can be employed to neutralize the charge and ensure the most accurate results. The unique SmartGrid minimizes effects of air turbulence, so that stabilization times are greatly reduced when compared to a traditional weighing pan. Weigh continuously without interruptions – any spilled samples fall though the grid to the drip tray, where they will not affect your weghing result. Easy, safe and secure. Direct weighing is accurate, fast, and fits any working situation thanks to the intelligently designed ErgoClips. For the fastest possible stabilization times, the MinWeigh door micro is essential. Minimize the risk of cross contamination: each panel of both the inner and outer draft shield is easily removable, and cleaned in a flash! StatusLight™ – Secure Weighing The StatusLight uses color to indicate intuitively the status of the balance. Green means ready, yellow is a warning and errors are shown with red. The clearly visible light communicates if the balance is ready for you to start your weighing task. Cleaning – Easy and Safe All parts of the inner and outer draft shield can be dismantled in seconds for the easiest, fastest and most thorough cleaning tasks. ErgoClips micro With our range of ErgoClip micro holders, you can directly dose into tare containers, thus ensuring the lowest minimum weight and helping to avoid sample transfer errors. EasyScan™ Check testing and calibration dates on RFID tagged pipettes. Record new test dates when you test using the balance application. Printers The robust P-50 series lab printers produce archival-quality printouts on paper as well as continuous and peel-off labels.